Its very hard to mistake this plant. It is a an erect succulent perennial cactus. It can grow between 1.5m-5m is size and normally has a well developed trunk with many branches, the lower branches tend to arch upwards. The cactus develop pads that range in size with the upper pads growing between 25cm-50cm in length and 15cm-30cm wide. The pads can be blue-green to grey-green in colour and are shaped a bit like a tennis /squash racket . The plant is armed with 2 kinds of spines, large fixed spines and also fine hairlike spines that easily penetrate the skin and detach from the plant itself (wear gloves if handling). The flowers can vary in colour from white to yellow to red, with each of the flowers producing just one fruit. The flowers are between 5cm-10cm is size. The fruits range in colour from green to red/ purple in colour and can grow to around 10cm in length and up to 8cm wide and are often referred to as tuna. They are broadly cylindrical in shape just like a barrel. They also have fine hairs/spines that need to be removed before consuming. The Pads,flowers and fruit can all be eaten. The pads taste a bit like a slightly acidic green bean when cooked. They can be boiled, fried, grilled or even chopped and diced into salads. The fruit is amazing and tastes to me like a cross between rock melon and water melon.The fruit can be eaten raw, turned into jelly, and even made into wine. Note: there are a lot of seeds. 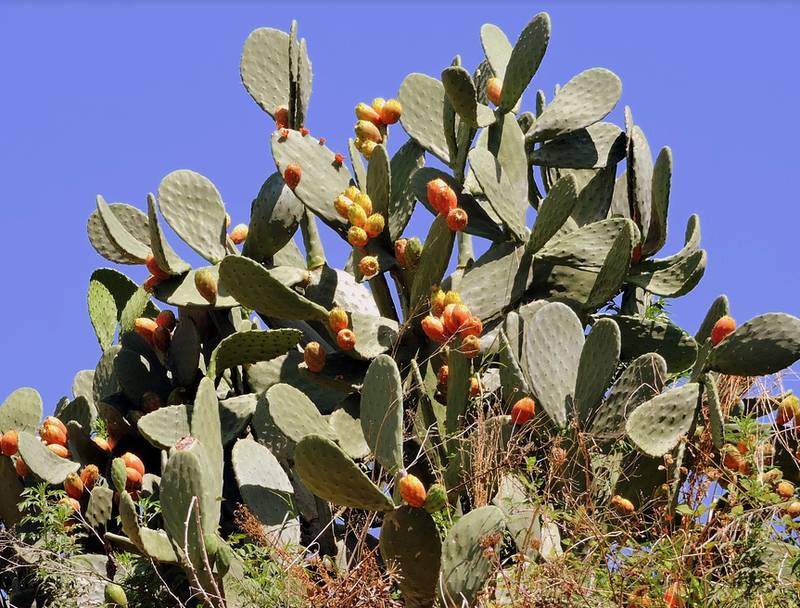 Prickly pear has been used to treat: diabetes,stomach issues, diarrhoea and dysentery, cuts, bruises,sunburn and constipation.